I seem to have fallen into a pattern of how I pack my lunch. I also made up a rule for Lunch it Punch it that sometimes irks me—no restaurant leftovers, ugh! It’s my own fault, but it made sense at the time and I guess it still does. I just felt like in a way I was still eating out by bringing the leftovers. Also I don’t necessarily pack low fat-diet foods, what’s the fun in that. My motto: Pack what you look forward to eating…that way you won’t be tempted to dump your packed lunch and eat out. So, here are the basics that I usually like to follow when packing my lunch. -main course-sandwich/wrap, leftovers and sometimes, like today, I love a great hot dog! 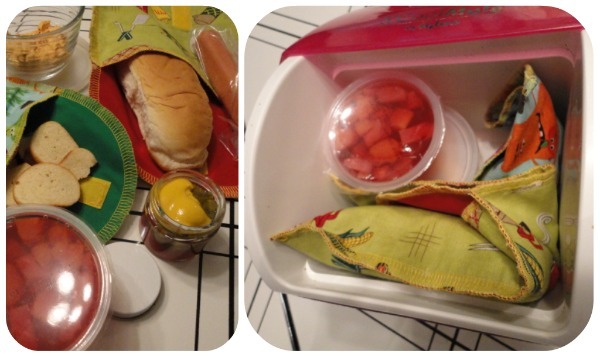 Where do you get the cloth sandwich and snack bags? I’m almost afraid to ask because I fear you crafty gals will tell me you made them! The Container Store sells a type and Amazon sells a variety, search reusable snack bags. Or if you’re like me you reuse the plastic hummus (the like) containers, which means your chips/crackers/cookies will not be crushed by shifting Pyrex and still no waste. Amy you’re in luck! I am not a sewing gal either…so I bought mine. FM also has a couple she bought at Park and Vine. Sometimes they can be a little bulky but I love em’ anyway and use them about everyday. You make your lunch look visually pleasing. I bought mine from SnackTaxi.com. They were really easy to order. I received them in approximately 4 days after I ordered them. I absolutely love them. They come in different patterns. What can I pack for my school lunch that I don’t have to heat up? I like to pack wraps or pita sandwiches. (Wraps travel well, especially if they are rolled up in wax paper) I fill them with Tuna salad, chicken salad, egg salad, or deli meat. I like peanut butter on a bagel, muffins + cheese and fruit (I called it the picnic basket). We’ll have to do a post of the best non-heat lunches and see what others pack!